Every time I think that Jal's going to do something to redeem himself somewhat, he turns it on my head and laughs in my face. EDIT:: Forgot yet again to mention that this book could use just a wee bit of tightening up at the seams; more commas, more semicolons, fewer run-on sentences (but, again, that might've been the edition I was reading). 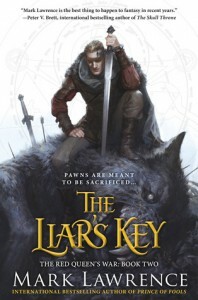 I enjoy a good rambling plot, but The Liar's Key definitely seems to have a case of the 'middle book humdrums' where it doesn't seem like it's entirely sure where it's going for a while. Still enjoyed it, still looking forward to the next book. Also looking forward to reading The Broken Empire books now, and his short stories, if I can scrounge them up anywhere.